NOJA Power unveils Broken Conductor Protection in the RC10, its award winning Recloser Controller. NOJA Power OSM Recloser Installation. 14 March 2017 – Brisbane, Australia. NOJA Power today unveils the latest in advanced functionality development for its Recloser Controller, the RC10. This latest implementation of an ANSI standard protection code grants additional capabilities in Broken Conductor detection. Given the simplicity of the ANSI 46BC protection scheme, Negative Phase Sequence protection techniques can now be applied by any user of NOJA Power RC10 controller to accomplish protection for broken conductors. This functionality forms part of the latest suite of firmware updates to the NOJA Power RC10 controller, and is available for use of any international users of the NOJA Power RC10. Negative Phase Sequence protection has been a mainstay in the protection suite offered by NOJA Power’s RC10 controller for many years, but the latest evolution of this functionality is the implementation of ANSI 46BC protection. Application of Negative Phase Sequence protection is an excellent detector of phase imbalance, however the values of I2can be sensitive to adjustments of real load due to practical limits in achieving balanced networks. ANSI 46BC Broken conductor protection compares the ratio of Positive Phase Sequence Current (I1) to Negative Phase Sequence current (I2), rather than each protection element in isolation. This assists in mitigating the variation of NPS values across the scope of energy delivery to customers, whilst additionally determining if there is a genuine phase discontinuity present. When three phase powerlines experience a discontinuity, the effective balance of current and voltage across the three phases is compromised. This discontinuity could be a broken conductor either landing on the ground, or a blown single phase fuse on one or two of the phases. These discontinuities may not necessarily result in higher overcurrents, as the leakage to earth may be high or approaching infinite (floating discontinuous cable still attached to an insulator). When applying Negative Phase Sequence Protection to any particular feeder, the protection engineer must understand the principle of negative phase sequence impedance, and then apply the correct settings based upon multiple fault cases. Positive Sequence Current is typically associated with the load placed upon a feeder, and is usually a measure of the “good stuff” being supplied to a customer. With too much positive sequence current flowing through a cable, it implies that there is an overload of customer usage (or usually a symmetrical three phase fault) and that the current should be interrupted to preserve the asset. Negative Sequence Current is essentially an imbalance in currents across the three phases, which can arise from multiple issues ranging from unbalanced single phase connections, heavy use on a particular line, or the occasional connection style of “Short Arm Syndrome” wherein customer connections are only made to the easily accessible outside A and C (Red and Blue) phases. Negative Phase Sequence Protection alone is typically set around 30% of the overcurrent configuration, and if this was applied to the feeders in Table 1 it could very reasonably be assumed that the broken conductor would not be detected. This is especially prevalent in lower load conditions, and this table demonstrates a case where a broken conductor could be detected with a high degree of confidence, despite a load current as low as 10A (highlighted). The elegance of the ANSI 46BC implementation is that the NPS value is not examined in Isolation, but compared with the value of the positive sequence current. Normal load variations can cause changes in the practical amount of NPS current seen by any particular relay, as demonstrated in Table 1. Variations in load during the course of a normal utility supply day could imply higher negative phase sequence current, but this does not necessarily imply a conductor discontinuity. The challenge arises however when there is a break in one or two of the cables, as this does not necessarily increase the Positive Sequence current, meaning that conventional overcurrent/earth fault relays may not detect the output. I2/I1 is relatively constant for any variation in load demand on three phases, but as soon as a discontinuity arises the ratio grows rapidly. Table 2 outlines an exploration of some of the typical ratios experienced in a three wire three phase distribution system. Whilst the presence of Negative Phase Sequence on any line implies imbalance, the practical truth is that the majority of distribution feeders will exhibit some level of NPS Current. Configuring a protection element which only acts on this NPS current in isolation can be challenging as the protection should be sufficiently sensitive to detect genuine fault imbalances, but also sufficiently large so that nuisance tripping does not occur. From this table however, it is clearly apparent that a healthy line has I2/I1 of approximately zero, but when a discontinuity appears on one or two of the lines, the ratio of I2/I1 rises above 20%. Considering that for most residential loads the Positive and Negative sequence impedance would be similar, it can be inferred that the ratio between I2 and I1 removes the need for impedance calculations as the impedances are cancelled out. The implementation of ANSI 46BC in the NOJA Power RC10 allows protection engineers to configure the ratio value at which a pickup is registered, with an appropriate definite timer to remove spurious tripping. Better still, the global configuration of 20% is a healthy ballpark figure to indicate the presence of a broken conductor. In the scenarios where Negative Phase Sequence Impedance differs from the Positive Sequence Impedance, this 20% ballpark value can be adjusted accordingly. This elegant implementation greatly reduces the complexity associated with implementing an NPS protection scheme, providing access to the benefits of the protection to a far larger group of users. This implementation has massive ramifications for utilities and private entities looking to reduce their bushfire risk. 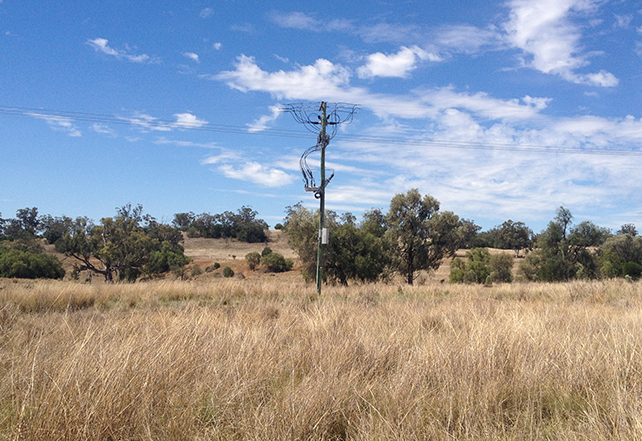 With international investment in bushfire risk reduction strategies growing significantly, these users are now granted with a simple solution to determine phase discontinuities and downed conductors. Historically, the challenge associated with sensitive detection of small imbalances was significant, however with the use of modern semiconductor relays paired with field protection devices such as the NOJA Power OSM Recloser system it is now possible to detect imbalanced conditions with far greater certainty. With the implementation of ANSI 46BC protection in the NOJA Power RC10 controllers, end users are now granted the capability of detecting Broken Conductors on their network. This latest iteration of protection functionality demonstrates why the NOJA Power RC10 controller is the forerunner in the race to be the most advanced recloser controller available today. By simplifying the most complex of protection schemes, NOJA Power is enabling all users both utility and private to capitalise on the latest protection capabilities available without the excessive complexity which is typical of advanced protection.